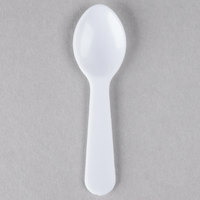 Give your customers a small sample of the products you have to offer with this Choice 3" white plastic tasting spoon! Perfect for your ice cream shop or food truck, this petite spoon allows your customers to taste some of your unique ice cream or frozen yogurt flavors so they can order several scoops that they're certain to enjoy. If you're implementing a new menu in your restaurant or bakery, use these tasting spoons to introduce some of your new dishes to your customers and increase sales. A Few key facts as you weigh your decision about this. These are sturdy and we use them to sample ice cream. In case you are debating between this spoon and the 3" Neon Taster Spoons, go with the white ones unless you use them for Soft Serve or Gelato. These white spoons have a unique subliminal draw, because the customer starts out getting a tiny spoon taste, while setting their sites on getting a nice full size white spoon with their Ice Cream. These spoons are a brand called Choice, and I utilize a lot of the Choice products and I have been quite happy with the customer compliments we receive. These are really good sized for giving out free icecream tasting. We have been using these since we opened. This is the best price we could find. Great little spoons! I use these for taster spoons along with the 1oz and 2 oz plastic cups I also bought at Webstaurant. But as for personal use they are the perfect size for sticking on homemade jello shots. Will definitely buy again! Good, sturdy, heavy duty little spoon! Great for demoing Italian ice or ice cream. I will be purchasing this item again and again! Good price! We love these small tasters instead of regular spoons for our chefs to use. Also very inexpensive for the number you get in an order. These tasting spoons are just what we wanted and expected. It would have been nice If they came in a box instead of ALL of them being bundled together, wrapped in plastic but regardless, they are still nice. You get what you pay for. The price and quantity are great, we will be rebuying. If you are using these on anything heavy or thick, they tend to break so be careful. Luckily they do not break into multiple pieces it's normally only broke in half. They are small, cute, and posh. They are made well, so they will hold up if washed. Since they are very affordable, they can be thrown away without feeling guilty. All in all, they were a great purchase and I am happy to have them on hand at all times. Pairs well with the free samples we hand out. Everyone thinks the small spoons are cute and they fit right inside our 3/4 oz sample cups. We use these spoons at festivals for sampling. They are very sturdy and hold up well. Much better product than what you can get at other locations. I love these taster spoons! From tasting the spices in the dish that I am cooking to giving the dog a taste of coconut oil to using as an applicator for facial product, these spoons fit the bill! A "go to" in our household! These are classic tasking spoons and a great value for the price. I am glad they include 3,000 spoons per case - I think we'll go through a bunch of these! These are great for sampling our desserts to customers! We also use them in the kitchen to taste each batch of frosting, batter, filling, etc. to make sure quality is consisted. These are a great value if you need them in bulk! Greta durable spoons. Perfect for sampling - works great with Dart 1 oz plastic soufflé cups. One case goes a long way - will reorder! We use these Choice Brand taster spoons in two of our creameries and we're very happy with the quality. We've used others in the past that seemed flimsy and would occasionally break with certain flavors. These hold up very well and allow our employees to portion out the perfect amount of a sample. Love these for testing the consistency of recipes as well as tasting baked good batters. They are a little short for using in high temperature situations but still hold up just fine. Would be great for ice cream tasters. These are the perfect sample spoon size! We used these for sample snow cones and they were perfect! They are thick and sturdy enough to scoop up an ice cream if you wanted them for that. am in love with these. we use them for our mini desserts and also for ice cream samples in the cafe, its just the right size for samples and mini bites. excellent & practical product, good & healthy for my business, healthy because that way my cooks don't have to put his fingers inside of the food, good for my business because now we are sure that the flavor is on the right point. Perfect for our baker to test different cake flavors. She mostly uses them to be sure the levels of extracts are correct for different flavors. These spoons are sturdy and just the right size for sample tasting. We use these to give our customers samples of our ice cream and toppings. Great Quality at a great price! These mini tasting spoons were great for an event where we sampled out ice cream. They are durable enough to scoop out small bites of ice cream. I was looking for some small spoons to give away samples. These are wonderful! They are great priced and the case will last a while! They are cute too! We use these white plastic tasting spoons very often here at my creamery, customers love being able to sample the ice cream! I would definitely recommend this product. WebstaurantStore always has fast shipping and is consistently reliable! This is a decent product for the price. Sometimes the spoons break on the harder ice creams so you have to place a finger behind the spoon to scoop. These work perfect for samples at farmers market, craft fairs, flea markets, for jelly, taste testing, and other canned goods. Box is small so easy to transport. The 3' White Plastic Tasting Spoon is great to have when customers want to just sample one of our products. I haven't had a single spoon break, and they're easily disposable. These are the perfect tasting spoons and great value overall. We use these everyday to taste our chocolate and they very convenient. Definitely recommend them. Great price for the quality and quantity for these plastic tasting spoons. They are sturdy and don't break or bend. They are accurate in size as 3 inches. These are perfect for our ice cream ship! Great size and are cheap. Always keep these in stock. Will buy again when we get low. Heavy duty and quality spoon. Great option for providing samples to customers. Easy to store in a container to keep in reach. Great quantity as well. This spoon is perfect for taste testing and it is sturdy enough for sampling ice cream. This is the best price we have found online! These are so handy to have around. Chefs use them to sample batches and we can sample product to customers with them. They are definitely a must-have! Price and quality is best Only, If it coming in 500 spoon pack better Box is not strong in shipping If they put stronger box better. Good quality tasting/sampling spoons. Great for little samples of anything, (ice-cream, pies, etc) Not chipped, not many broken once. Good price for the product. Will order again. These spoons hold up very well when sampling our several ice cream flavors. We're a high traffic ice cream shop and these handle well when having to sample quickly. These cute little spoons are perfect for giving our customers samples of our different ice cream flavors! Strong, durable and just the right size for the job! perfect spoons for doing a quick tasting of a batter or a buttercream or whatever food needs just a quick taste! i would purchase again definitely! Can't go wrong with this purchase! We use these all the time for samples in our food truck. Perfect size and easily stored away. We pair them with the portion cups (#374F050) -great combo! I searched high and low for these little guys. They are perfect for sampling and tasting items. Inexpensive so I didn't feel bad when handingg them out fo r tasting purposes. These white tasting spoons are nice and durable and a great price for the quantity purchased. We would prefer a compostable version to keep our honey tastings completely zero waste if you have those available! I decided to try these out out because of the price (they are significantly cheaper than the spoons I had been purchasing). However, it didn't take long to realize they would not work. I bought them with confidence after reading so many positive reviews here, but was totally surprised at the lack of durability. I'm glad they have worked well for so many people, but just be aware that they are fairly flimsy and they snap easily. We were using them for soft-serve gelato, and just about every other spoon was breaking. I don't recall hearing of a single spoon breaking prior to getting these. Webstaurant customer service was great, as always, and they took care of the issue, and I was able to send all the unopened cases back. I only write this review to represent the opinion that these are not as "sturdy" or durable as many/most of the reviews would have one believe. Thank you for your feedback, Stephen! We are sorry you did not prefer these tasting spoons, your account has been credited! Bought these little tasting spoons for food samples at a town event recently, and they were perfect! Could only find a single store locally that sold these but they only sold them in by the case (it would take me years to go through 3000 of these!) so I was very pleased to be able to buy these by pack. The most economical taster spoons you can buy. The quality and size are very good. Great for sampling tiny dishes from a small 3oz cup. Would definitely buy again, 250 spoons come in a little bag that is great for transporting. Very usefull for samples. Small and not very expensive, easy to grab and give to costumers. Small size comes in wite or colors. Very good for samples. Excellent spoons for sampling our nut butters at our local downtown market. We are also very happy with the large quantity of spoons that come in the box. I would, however, like to see the bag sealed a little better for the sake of cleanliness rather than just being sealed with a twist tie. we used these for ice cream and sno cones. They are very tiny but perfect for small treats and tasting samples. they worked perfectly for us. I keep these around so food items can be tasted without worrying about contamination. Cheap product containing enough tasting spoons to last a long while. I purchased these spoons for multiples purposes. They are perfect to pack in bento boxes to spread peanut butter on carrot sticks and celery sticks to make ant logs for lunch. They are also perfect for scooping out tooth powder instead of dipping the toothbrushes into the container. And for some reason, these spoons make eating ice cream more fun for our kids. These are the perfect size for using for ice cream samples. They are strudy and strong. They Enough so brittle that they break with you scoop the sample of ice cream, they flex a little. These tasting spoons are perfect for our events outside of our store. They are sturdy, even when serving frozen products. We will definitely be reordering these spoons. I used these spoons for cheesecake samples at a vendor fair and they were perfect! Sturdy and just the right size! They are a good price for the quality and quantity. I will definitely be ordering more in the future. these little cute taster spoon is very nice and easy for people to eat ice cream with. i would totally buy again once i ran out. These are good taster spoons. We use them for our catered mini desserts. They are not fancy looking, very simple and plain, but do the job. The 3" White Polypropylene Taster Spoon is a really good item to have in our home. The children enjoy using them for ice cream. The quality is great as well as the price. This is definitely a great value. Great spoons when I have samples for people to try! And it works great for me too when I am tasting my food. Very convenient to have around even for home cooks. We go through cases of these spoons every year, they work great for scooping soft cheeses. The are sturdy enough to use on cold products that are pretty firm. We would recommend these! Loved these for events big and small. They are very economical and make it easy to offer appropriately sized samples to customers. Very economical and good quality. This white taster spoons are very cute with tiny desserts in a shot glasses. It is not only for tasting use but also very nice for plating mini desserts! The quality is a tad bit lower than what we expect. Not a clean white materials, so it gives a bit cheap feels. But the price is great for the quantity in the box. I challenge you to find a better deal on tasting spoons. Any good chef tastes throughout the evening and these are an excellent way to do that without costing a fortune. These are just what I needed for my tasting event. I frequently will serve samples of food product at food exhibits. Also great to use for appetizers needing small spoons. We love this taster Spoon, they are the less expensive taster Spoon I have found. It is the perfect size for gelato tasting. We use them every day to allow or customers to taste all our flavors. These little spoons are the cutest things ever! They are very durable and work perfect for my frosting shots I make in my bakery trailer! Would recommend! They add such a cute touch! We purchased these during an emergency when we got hired to give out samples at a mall - the size of these spoons are PERFECT for sampling. It's like the typical white spoon a restaurant or any ice cream shop would give you to sample their food. We will definitely be buying these for our next events. P.S. - this price could not be beaten!! Perfect utensil for allowing customers to taste our new flavors of hand dipped ice cream. Allowing customers to sample flavors has helped us sell extra scoops. These are a cheap and easy way to sample product without having to clean the spoon or heaven forbid use your finger. We definitely recommend this product. We have been using these little taster spoons to sample hot cobbler. Perfect size and price...and we have never had any break, etc. Definitely worth the price! We use these taster spoons in our fudge containers. We also give them to our wholesale customers when they buy fudge tasters. They're perfect and much cheaper than we have found anywhere else. Great taster spoon. We use this spoons together with 0,5 oz cups for offering samples of our spreads and dips. Together presenting a right amount of sample. These spoons are the perfect size for our Cake Kit, they fit right on top of the cake mix and icing mix. They are a great little extra for the customer purchasing the cake. We sell ice cream at our store and use them for giving out ice cream samples. They are a good size, economical and ships quickly. Awesome spoons. We never had any of these break. They are of good price. We use these for our customers to sample our dressings, and we will continue to buy these. We use these spoons to test taste our icings. The spoons are not sturdy for harder product but work well for what we use them for. This was the best price we found when searching for taster spoons. These taster spoons are the perfect size for sample tasting of our cakes and buttercreams at bridal shows. They aren't expensive and there is less waste than if using full sized. Customers think they are cute, too. These 3" polypropylene spoons make perfect tasting spoons and sampling spoons for our products. They are appropriately priced and it's nice to know I can go through 3,000 samples before I need to reorder! Unfortunately, this product is too flimsy for ice cream use. Other applications are fine as long as it is used for something not hard or thick. We use these taster spoons for our homemade hard ice cream shop. While they can bend a little with the really hard flavors, they work great with softer ones. We've never actually had a single one break, so they don't break...just bend. I did find a taster spoon that was perfect for even the hardest flavors, but it cost almost 3x's this price. Therefore, I'll stick with these! These are great spoons for sampling items. I also use these for sampling my Italian ices. The kids usually wind up liking the tiny spoons to eat the icees with. This product is perfect! It is very convenient and cost effective to use these spoons instead of the large ones that customers normally grab to sample. It is so much cheaper than the leading competitors. I bought ten cases to get the discounted price. I use them to give samples of homemade ice cream so not hard ice cream. They worked ok if when didn't break. Too much breakage. Thank you for the review, Linda. We're sorry these spoons have not suited you. We suggest considering these Dart Solo 00080-0222 3" White Plastic Taster Spoons instead. This taster spoon is the best we have ever used! Very good quality for the price too! Customers appreciate the service we provide with being able to supply them with a sample of our ice-cream. These spoons look professional and they are very functional, too. We use them as tasting spoons and they are great for small children to use as a regular spoon. It will easily reach the bottom of a 5 oz. cup or dish. They are sturdy enough to use for ice cream, too. These are just what I was looking for. They are the perfect size for customers to use when sampling our deli products like fresh salsas & pestos. A great price as well. These are great for when we do sampling of products. We save a lot of money over using full-sized disposable spoons and are using less plastic this way. Stop wasting heavyweight spoons just to give customers a little taste, Use these taster spoons to close the sale. We use them for our ice cream and Italian Ices. These are great little taster spoons that will be perfect for our snoball business. I'm glad I purchased them instead of wasting all of my big spoons for a customer sampl. Exactly what I needed for sample at a trade show. Sturdy enough to scoop into Pecan Pie. And price was just right too. Would purchase again. Although they are compared to the Dart Solo 00080-0222 3" White Plastic Taster Spoons they are not suitable for hard ice cream. They do not break but bend very easily. I would never buy them again unless I served soft-serve. Thank you for the review, Claudia! We're sorry you did not like these. A Customer Solutions Representative will contact you shortly. So cute!! That really should say it all. We use these spoons to give out tastes of our fudge. They are just the right size to be able to give customers just the right amount. Perfect little spoons for samples so I don't have to use the large sized flatware. They are pretty sturdy and cheap enough that I feel comfortable leaving a bunch out. These worked pretty well, but they were a little too small and too flexible for samples from our hard ice cream. I would order again but might look for a slightly larger or more firm version. These spoons are the perfect size and price for passing out samples of our Mediterranean Salads. Very Happy with our purchase and will be ordering again. Perfect tasting spoons. We use them to sample hard, hand dipped ice cream and they work well. The price is right too since we use a ton of these. For taster spoons, this was the best deal out there. The quality was pretty standard, but they arrived on time and in great condition. I wish these came with a compostable or more environmentally friendly option. Here at Alicia's Homemade we use as many spoons as you could imagine! We use them for sampling sauces, hot meats with rubs and also homemade Applesauces!!! You will LOVE the smooth texture of the spoons and the stark white will make your food pop! We love these! Also we LOVE THE GREAT PRICE! It's great white plastic spoon! It's good for desert spoon. Also not only quality as well, great price ever! Cheaper than any other vender in town! This is a great little spoon for giving sample tastings. There are 2 taster spoons on Webstaurant and I have ordered both and went with the higher price once because they appear to be brighter white in color. They are just as sturdy as the other taster spoon and would order either of them again. These were shipping the same day I ordered them!! the price and quality is great!!! Will order from this site again!! Perfect for what we needed!! Cute little size not only for sampling but for D.I.Y. toppings scooping. Heat proof too. Will not be without these in various places, even the silverware drawer for tasting foods to be sure things are properly seasoned. Great price!! No way to find a better price anywhere. We use this for our customers to sample our flavors of the ice cream we sell. Perfect. These spoons are perfect for taster dessert tables. We put a small spoon in every tiny dessert cup so guests can help themselves. They are tiny and elegant. I purchased these spoons to use for our bakery...surprisingly, not for customers, but for us the workers! We have to sample our batters and mixes, and instead of using full size spoons you have to wash, we just use these and toss them into recycling! Love the price! We use the to sample our ice cream. These white spoons are almost of what we pay through our distributor and pretty much the same quality! Great value been buying for 3 years now! Thought I could use this product for frozen yogurt but I find it is a little too small for that use. I began to use it for sample cups instead and it seems to be serving its purpose! We give out samples of all our handmade sauces and these spoons come in very handy. There are not too many places we can get these locally. The prize is excellent for what I needed it for; at health fair for tasting! You will not be disappointed. I will order it again!!! The perfect little taster spoon and you get a lot for the money. We use these everyday in our ice cream shop. Shipping was super fast. Great tasting spoons for products. They come in very handy when launching new products and demo products at stores. I prefer that they are now coming in bags! We just started serving unique vegetable flavors of ice cream. These spoons are great for offering customers a chance to taste before committing. Sturdy enough for scooping ice cream directly. These spoons are perfect to add for tester or sampler products. We use these with our spa salts and they have been a nice alternative to our previous spoons. We brought these spoons to use in our ice cream shop to accommodated our customers who are not sure of their choice of flavours. They are cute and just right for tasting. it's very tiny and cute spoon for the dessert like pudding. very solid and not easy to get broken. and the price is also reasonable. These spoons were perfect for giving out samples of our Maple Syrup...not too much an not too little. Plus they are cute to boot! Will order again! I make my own BBQ sauce and when you tell someone that, they want to taste before committing to their plate. These spoons are a great sanitary way to allow people to do that. We love these spoons for sampling our products! They are perfect for soups, stews, cobblers, just about anything that can be spooned up. They are nice and stiff and hold up extremely well.